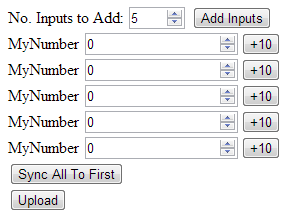 This post follows one from another - Adding Form Controls Dynamically with jQuery. AT the end of that post, I mentioned that dynamically added form elements can often not have pre-defined events assigned to them as these elements are added after page load. Here's an example of adding a few textboxes to a form along with an associated button for incrementing the textbox value. This is just a trivial example, just to show the issues that can arise. OK, so far so good. 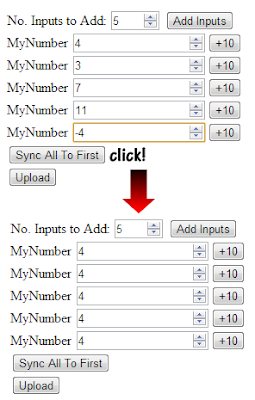 If we manually change the inputs and press 'sync', again everything works fine. Magically this does the business - click the 'Add Ten' button and the associated number input increments by 10. OK, you can argue that this isn't the most inspiring of scripts, but at least it shows how you can bind an event to a dynamically-added element.